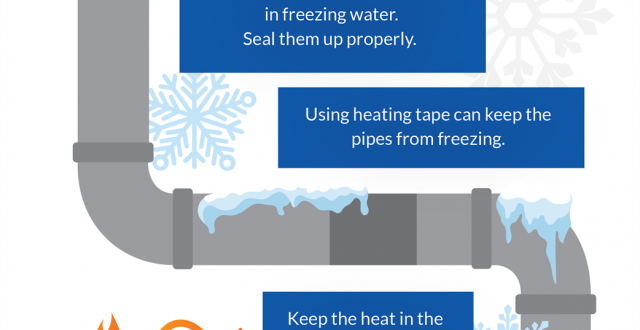 Avoid frozen pipes. Watch your water pressure this time of year because the first sign of a frozen pipe is restricted water flow. Let cold water trickle from your faucets, slightly smaller than a pencil’s width, during the evening when the temperature is the coldest. This helps prevent freezing, as moving water does not freeze. Disconnect garden hoses and drain outdoor pipes to prevent damage during the winter. During cold snaps, if a garden hose is left connected, ice can form and pressure can build up in the water lines inside your home. Once this occurs, a water line leak or break could occur and cause severe damage to the home. After disconnecting garden hoses, you should install an exterior, insulated faucet jacket. This will protect your outdoor faucets, as well as the connecting lines running into the home, from freezing temperatures. Be sure to utilize the shut-off valves located inside your home to drain water from pipes leading to outdoor hose bibs. These valves can typically be found under sinks, in crawl spaces or basements, near your water heater or your meter, but every home is different and some homes may not be equipped with these valves. Circulating warm air helps keep pipes in the walls from freezing. Keep your house temperature above 55° to prevent pipes from freezing and open cabinet doors under sinks and faucets and near exterior walls to help circulate warm air and keep pipes warmer. One of the more simple winter home tips is to close crawl space vents and garage doors, especially if your water heater is in the garage. Check that snow is not restricting your water drainage. Watch the area around your sump pump discharge line, used to avoid flooding indoors, as this line drains from a basement to an outside area. If the drainage area is blocked by snow or flowing into a puddle, freezing could occur, as well as water backing up into the house. The best defense to ensuring your plumbing systems are running properly is to schedule annual maintenance inspections, and keep on top of your systems before it’s too late, or when you need them most.